This felt hat has dangling metal jingle bells to make some holiday noise wherever you go! 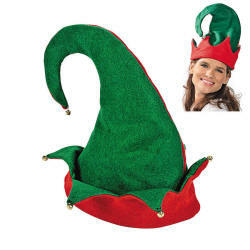 In festive red and green, this jolly jester topper is the perfect accessory for a Santa’s helper costume. You can also wear this elf hat to work to add some Christmas cheer to your day. Each hat measures about 22" around the base (the part that fits your head).